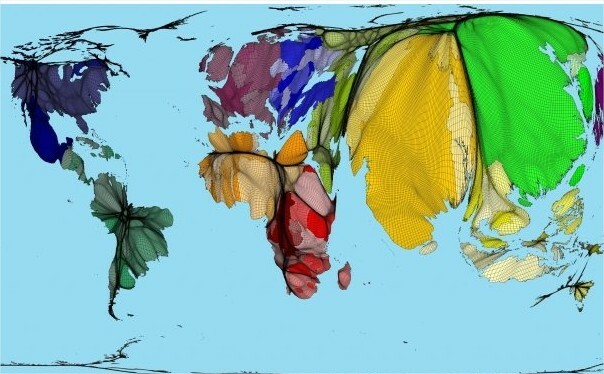 Great maps here showing continents and countries based on their population size. This is an example of a topological map where it only shows a certain type of information disregarding a normal scale. Australia looks like a sqaushed fly appropriately! 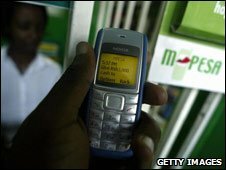 A really interesting article on the BBC news website which looks at the growing role of Mobile phones in many parts of Africa. Kenyans are able to buy small items simply by sending text messages to the sellers. In the video the journalist deposits 500 schillings and then buys samosas at the local shop using the technology. You have to enter a Pin which provides some form of security. Interestingly there are more people who own a phone than a bank account which makes the M-Pesa solution ideal for many Kenyans. Why is it taking so long here? It has been attempted and I suppose the Oyster travel card scheme is the most similar but how often is it used for a cashless transaction? The Daily Mail reckons it could be by 2012 we’ll be using phones as credit cards and we’ll have the true potential for a cashless society. It seems as though the Kenyans are already there! Great website here with a range of tests and case studies. Have a go at the World Life Expectancy Test. How long will you live for? How good is your knowledge of North African Countries and the Middle East? Frequently in the news it is an area of incredible historical and political significance. The question is, do you know your Tajikistan from your Mauritania? 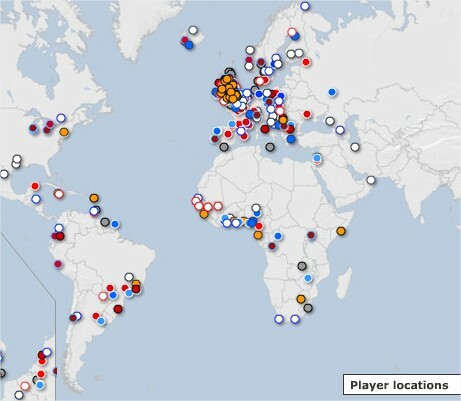 Check out this map quiz. Some fantastic pictures at the Big Picture page on the Boston Globe website. This is a neverending source of amazing photography and I highly recommend you subscribe to the page via a feed reader such as Google Reader. The pictures this time are about a prayer festival in Tibet. Tibet is often referred to as the ‘roof of the world’ as it is the highest region on earth with an average elevation of 4,900 metres. It is technically part of China although the Tibetans for a long time have wanted to return it to being an independent Buddhist Kingdom with the Dalai Lama as head of state. It’s amazing when hyper inflation affects a country. In Zimbabwe they’ve just introduced the $50 billion and $20 billion note. Read about it on CNN here. It costs, at present, $20 billion to buy half a loaf of bread. Three weeks ago $20 billion would buy you 20 loaves of bread! So if you want to be an instant billionaire, head for Zimbabwe! I remember when I was is Zimbabwe in 1989 that they’d run out of paper and you couldn’t buy a newspaper after 6am in the morning. All the cold drink bottles had no labels on them so you couldn’t be sure what the product was that the supermarket was selling. It’s desperately sad what’s happening there and all from a corrupt government with a leader, Robert Mugabe, who is clearly not fit for office. Some are calling for British intervention. Neo-colonialism could be the solution as it was in Sierra Leone. Here are some extremely strange and eccentric buildings. 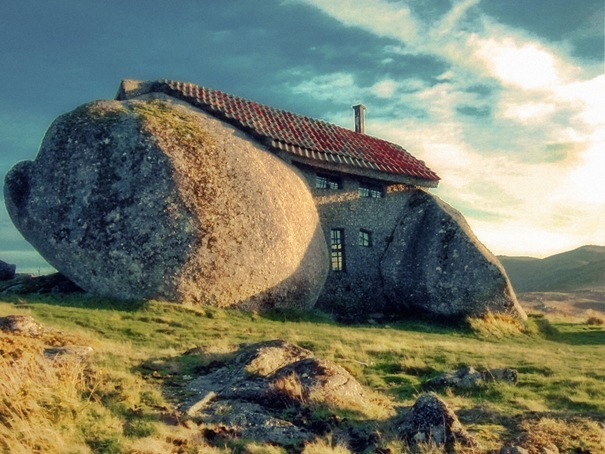 I love the Stone House in Portugal! I went to the Guggenheim in Bilbao, Spain last year and thought the building was incredible but also remember the huge spider and dog made from flowers outside too. Long live artistic, eccentric thinking! The flower dog outside the Guggenheim.